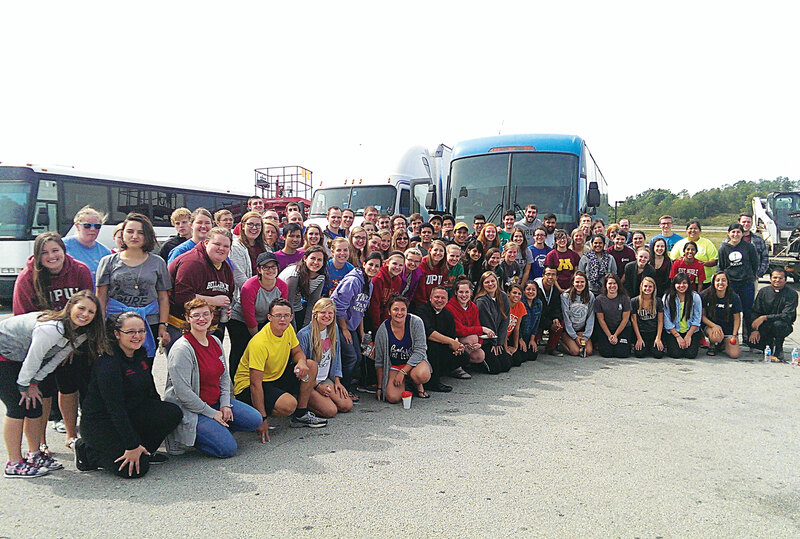 At 4:30 on a recent chilly Friday morning in Indianapolis, a group of 90 young pilgrims huddled together in an Indiana University-Purdue University (IUPUI) parking lot in Indianapolis next to the brightly illuminated campus center tower. Their sleepy chatter began as a low murmur, but soon took an excited leap as the deep—ruga-ruga-ruga of two big buses rounded the corner. One crowded rush and 90 pillows and lumpy Adidas gym bags later, the buses began their 624-mile trek to Philadelphia. Father Rick Nagel, pastor of St. John the Evangelist Parish in downtown Indianapolis and leader of the Catholic student organization on the campus of IUPUI, led our group of young adults, college students and missionaries. He helped us focus on the Lord in the midst of the excitement. Father Rick’s question hit me between the eyes. Up until that moment, I had been so busy focusing on just making the trip without dropping the ball academically (I’m in medical school and had three exams coming up), I hadn’t thought to be prepared for any big things God was getting ready to do in me. At the end of our next group novena, I asked the Lord to help me be aware of him and his Providence throughout the trip. I didn’t need to wait long to see Providence provide. Without warning, our bus lost power. The lights went off, the engine cut out, and we drifted slowly to the side of road, totally inert. “Well,” said Father Rick as the bus driver hopped out to check on the engine, “let’s ask our Blessed Mother for some help.” We prayed exactly one Hail Mary, and as we said the word, “Amen,” the engine roared back to life! At first, I thought this bizarre engine difficulty was just harassment from the Enemy, so I wasn’t prepared for how the Lord would later use it to bless us the next day. As we were driving into Philadelphia from our overnight lodgings in West Chester, Pa., on Saturday morning, the engine briefly malfunctioned, setting us back a mere 60 seconds or so. However, as we attempted to merge onto a larger freeway close to downtown, the police vehicle driving just ahead of us flipped on his lights and stopped our lane of traffic. What was going on? Was something wrong? A thought occurred to me, and I checked my watch. The pope had landed at the airport in Philadelphia just 20 minutes ago. I checked my maps application on my iPhone. The airport was right next to us, and the on-ramp next to us led right to it. Sure enough, within 10 minutes, an enormous motorcade of squad cars, motorcycles and SUVs flanking a tiny blue Fiat drove right past us, and a small man in white waved through the window! The whole bus went nuts, some people streaming out of the bus onto the ramp for a better view, the rest of us snapping photos, cheering and even weeping inside. We hadn’t even made it into Philadelphia, and we had already seen the pope! When we reached Philadelphia, our group split up, and we were free to explore as we wished. Some pilgrims visited the Shrine of St. John Neumann, where his remains are interred. Others sought good places to see the Holy Father when he would parade through town later that day. Feeling like a bit of a studious loser, I found a quiet place to study away from the hubbub until the papal parade later that night. However, when I tried to get through security at 6:30 p.m. (just one hour before the parade), I ran into a serious problem: I needed a ticket for this gate—which I didn’t have—and the next nearest gate was many blocks away. I needed a miracle! No sooner had I begun to pray silently when a nearby usher with a grizzled goatee and a grimy neon coat walked up to me and asked quietly, “You need a ticket?” I nodded. He looked slyly to his right, and with his left hand handed me a bright gold ticket! I was so stunned I could hardly speak. An hour later, I was 15 feet away from Pope Francis, who smiled and waved at me. If that had been the only time God made a way for me that weekend, maybe it could be written off as a bit of luck. I said a quick prayer, and began searching Craigslist for tickets. Sure enough, some were available, but at $100 each (minimum!) I finally found a listing where the price hadn’t been set. I e-mailed the ticket owner to ask how much he wanted for one ticket, not sure that I’d even get a response. Within 30 minutes, the owner of the ticket had e-mailed the PDF ticket to me for free! Glory to God! As our band of pilgrims filed onto the bus after Mass, dusty, exhausted and happy, I sank into my seat and grinned. Even though Father Rick had warned me to be ready for what God had in store, I hadn’t been ready for such generosity.